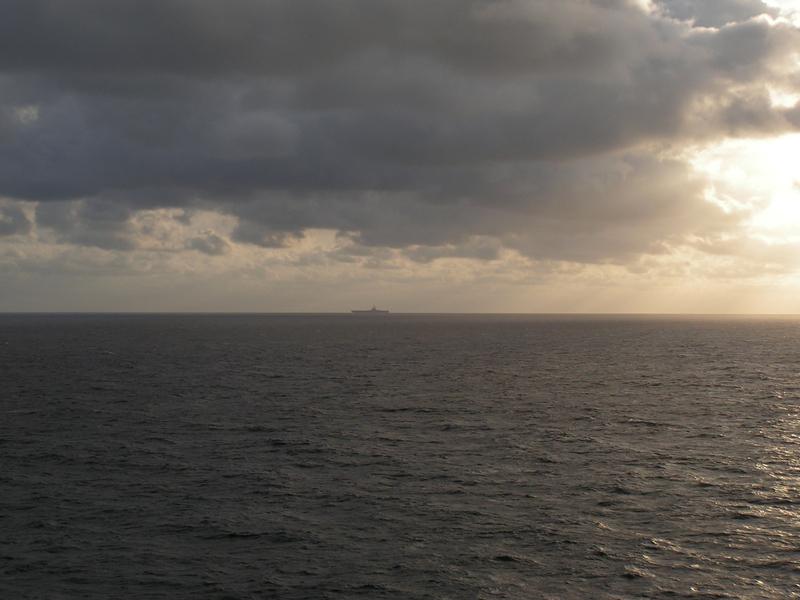 The ship was moving on her stately path, on a calm sea with only a few white caps shining, when on the horizon I saw it, a ship against the horizon, in rays of sun breaking through the storm clouds ahead. 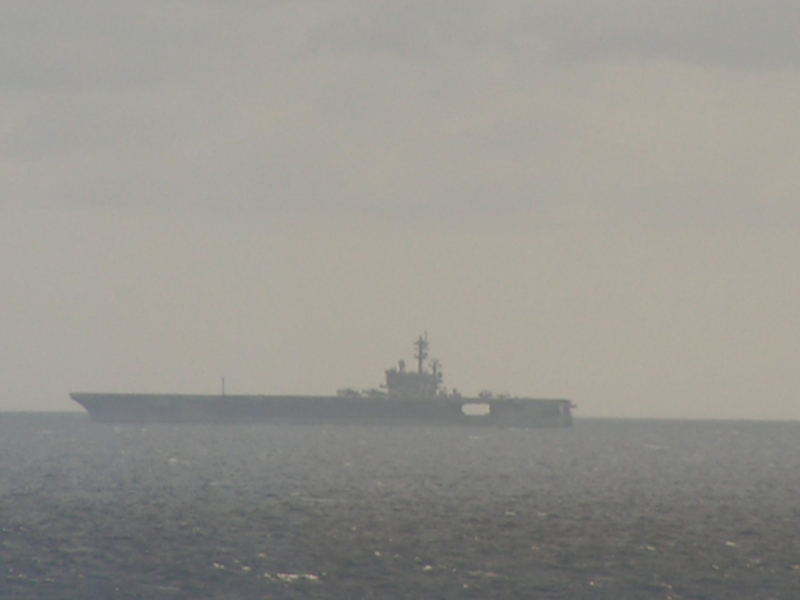 A carrier, no battle group, all alone. The cruise ship, with its happily sleeping or earnestly jogging passengers, a ship designed to pamper it’s passengers with food and drink, spas and the solarium pool, keep them entertained with pools, games of all sorts – passed peacefully by the ship whose whole life will be or has been defense of it’s home, carrying the flag to ports from Naples to Norfolk, Istanbul to Reykavik, Majorca to Johannesburg. We were alone in that sea together, one heading to Bermuda for fun and games, one heading West – maybe to home port, or to sea trials, or to find her group – I wonder, did anyone over there look over and wonder about us? How many of us cruising looked over and thought about the men and women aboard the carrier, who were working, who were away from their families? There were a few, who looked and wondered and maybe said a silent thank you. We are out here, in our own little self contained world, cruising along with groaning buffet tables and dinging elevators, with a slight shudder the only sign other than the view out the windows that we aren’t at a hotel or resort on land. A comfortable bed and it’s not a hardship to put the shorts, tshirts and sandals of a planned week of vacation into the cute little dresser and stow the toothbrush and toiletries in that cunningly designed cabinet. But how is it in that other selfcontained world, with narrow ladders and clanging hatchways, bunks and lockers – with a galley and mess hall – instead of the lavish choices of restaurants and bars, the never ending flow of pizza and french-fries, blue drinks with little umbrellas and Moet in champagne flutes that we are enjoying. Who was that carrier? I don’t know. But I say thank you to her crew, and to her families, the families who waved goodbye and are waiting quayside to welcome them home.